WE DO! - The Gift of SNIFF! Unleash your dog's inner "Sherlock Nose" and learn how to better read your dog's intentions and individual communication style. Giving your dog "the gift of sniff" will enhance your relationship with your best friend and provides the necessary mental stimulation that helps keep dogs healthy and happy. 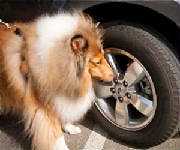 Teaching your dog scent-detection (to find a specific object (keys, wallet, remote control or an odor) is an excellent way for your dog to build confidence, burn lots of mental and physical energy, and have a blast! Nearly all dogs have excellent noses, therefore, K9 Nose Work classes are perfect for dogs of any age, size, breed-type, or personality. Because all dogs work one at a time and are crated during down time, this is an excellent class for dogs who are shy, dog reactive, or newly adopted. It's also a great class for dogs that need a lot of mental and physical stimulation and are eager to continue their training. K9 Nose Work classes will give your dog the opportunity to build confidence in new environments, and work around obstacles without the stress of interaction with other dogs. Please note: Because each dog works individually while the other dogs are outside of the room, dogs must be able to be crated away from their handlers or in a properly equipped vehicle. Level 1 is a class for all dogs because they all have an inherently amazing sense of smell and a natural desire to hunt. The class is designed to develop your dog's natural scenting abilities by using their desire to hunt and their love for toys, food and exercise. It's a great way for your dog to have fun, build confidence, and burn lots of mental and physical energy. The primary goal of the class is to have fun! For this class we do not require that dogs have any previous training experience, although good manners are encouraged. We only require that your dog be capable of handling confinement during the class, either crated away from their handlers or in a properly equipped vehicle. Because all dogs work one at a time and are crated during down time, this is an excellent class for dogs who are shy, dog reactive, or newly adopted. It's also a great class for dogs that need a lot of mental and physical stimulation and are eager to continue their training. The Nose Work class will give your dog the opportunity to build confidence in new environments, and work around obstacles without the stress of interaction with other dogs. This class builds on K9 Nose Work - Level 1.5 class. In this class, the dogs learn to search for an essential oil (Birch) and continue building a better dog/handler team. Prerequisite: K9 Nose Work - Level 1 (Intro to Nosework) and Level 1.5 . This class builds on the skills learned in Level 2. This class is for dogs who have completed an Intro to Odor class and can show that they can find their intital target oil (Birch) and continue building a better dog/handler team. Prerequisite: K9 Nose Work - Level 2 (Intro to Odor). This class is for dogs who have completed an Intro to Odor class and can show that they can find their intital target oil (Birch). This class focuses on learning all the elements of competion (intereior, exterior, container, and vehicle searches). Prerequisite: K9 Nose Work -Level 2 (Intro to Odor) & Leve 2.5. This class is for advanced nosework dog/handler teams and is taylored to those specific teams. More challenging training scenarios are introduced and are geared toward competition. The other two target oils, Anise and Clove will be introduced. Prerequisite: K9 Nose Work Level 3. If you are interested in any of the above K9 Nose Work class, please email us at info@adogsday.net or click the Contact Us tab and fill out and submit the inquiry form.